Bouncing a check can cause problems in several ways, and your credit is one hotspot for potential trouble. The good news is that if it’s a rare occurrence, your credit will probably come out fine – as long as you fix the problem quickly. A bounced check does not immediately show up in your standard credit reports, and it might not ever show up. The major credit reporting bureaus (Experian, TransUnion, and Equifax) mainly deal with information about loans, or who you’ve borrowed from, if you’ve paid late, and if there are any public records related to your borrowing history. Your bank does not report every single check to those credit bureaus. The FICO credit score is the most popular credit score, and it’s the one that gets used for most big loans like auto and home purchases. However, alternative scores are increasingly popular, especially for people who have not had the chance to build credit and for people who are rebuilding after financial difficulties. Alternative credit scores look at more than just your borrowing history. Utility payments and rent payments can show that you’re reliable, even if you’ve never borrowed in the past. But if your rent and utility payments bounce, you won’t look as good on those scoring models. Eventually, a bad check can show up on your standard credit report at the three major credit bureaus. 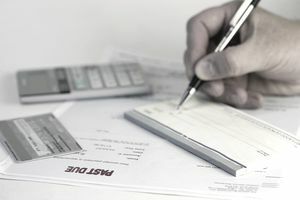 If a bill goes unpaid, your account may eventually be sent to collections (meaning the creditor hires a collection agency or sells your debt to them, so that they will attempt to collect what you owe). Collection agencies will report your debt to the credit bureaus and those entries will hurt your credit. The collection agency might also bring legal action against you, and any judgments against you will also do some damage. If you bounce a check, contact the payee immediately and pay what you owe—don’t wait for them to call you. Especially if you were making a payment for a loan (like your home loan or credit card), it’s essential to straighten things out within 30 days. Late payments on loans appear on your credit report and they drag down your credit scores. However, you often have 30 days after the due date to make your payment and keep your credit intact. You’ll still pay bounced check fees and late payment fees, but you can avoid damage to your credit by acting fast. The most popular credit reporting agencies, which are often used for loan and job applications, do not track your checking activity. However, there are other “consumer reporting companies” that gather and sell information about you. One of those is ChexSystems, which tracks bounced checks and insufficient funds. Unlike the major credit reporting agencies, it’s a bad thing if you have a ChexSystems report, as only people who’ve had problems with their bank show up in that database. Based on information about your past, banks might refuse to open a checking account for you, or they might close an existing account. Other databases could also make it hard for you to use your checks. For example, you might have a hard time writing a check at a store if the merchant uses a check verification service to screen for bad checks. There are numerous reasons to avoid bouncing checks. In addition to potential damage to your credit, you’ll have to pay extra fees, and you might even wind up with legal troubles. Keep track of how much money you have available, and make sure you don’t go below zero in your checking account. Bouncing the occasional check might be a sign that you’re busy or distracted. But if it happens regularly, it’s a sign that you need to make changes and get back on solid ground. Get balanced. To track your account balance, learn how to balance your checkbook. You’ll know (before your bank does) where all of your money is going. Get alerts. Sign up for text or email alerts so that you know how much you have in your account, and when money leaves the account. This allows you to take action before problems arise. Get protected. If you’re still bouncing checks, look into overdraft protection from your bank or credit union. The bank will (sometimes) pay when you run low on money, and you’ll repay what you owe to the bank instead of bouncing a check. This service costs money, so learn about the pros and cons before you sign up. Can the Bank Take Your Car If You Don't Make Payments?